I’m sharing my Game Day Party Food Ideas that’s perfect for either a few people or for a crowd! I added Frank’s RedHot Bone-In Wings to my spread this year – the family and friends are loving them! Delicious and flavorful wings are a favorite on game day and now you can quickly make some for of your guests by purchasing Frank’s RedHot Bone-In wings. Frank’s RedHot is the original buffalo sauce and it’s one of the three varieties you can choose from: Frank’s RedHot Bone-In Original, Frank’s RedHot Bone-In Buffalo, and Frank’s RedHot Bone-In Kickin’ BBQ, and you can pick them up at Wal-Mart in the frozen food section! When there’s a game on, people expect to eat. That usually means there’s at least one person preparing food and cooking it. Frank’s RedHot Bone-In Wings are flavorful and tasty and incredibly convenient to serve! By serving these for guests you can save time in the kitchen and more time surrounded by friends. The options are endless when making a football food spread but there’s always one thing in common – a delicious and creamy dip. This dip can be used for vegetables or for wings – it pairs great with Frank’s RedHot Kickin’ BBQ Flavor Wings! Serving a vegetable spread is always a good idea at party. People like to snack and vegetables are not only healthy but really tasty to snack on – especially with dips and sauces! 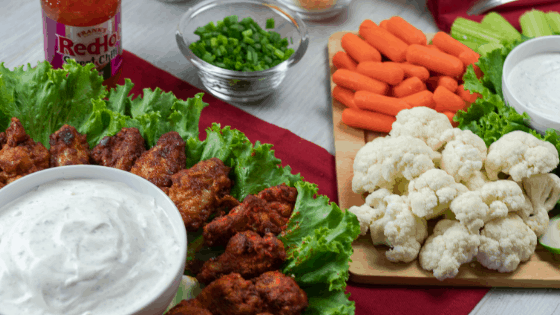 My Homemade Ranch Dip tastes great with all veggies but Frank’s RedHot Sweet Chili sauce tastes really great with vegetables, too! I make a pot of homemade chili to add to the spread because it’s filling, delicious, and a great comfort food. Serving the chili with scoops or chips, sour cream, scallions, and cheddar cheese gives options to suit your guests’ tastes! Don’t get stuck in the kitchen making food all day before the game. You can make this possible by making ahead dips, chili, vegetables, and even wings. You can keep Frank’s RedHot Bone-In Wings warm in the oven until you are ready to serve them. They’re flavorful, easy to prepare, and the family will love them!